And what's the best thing to do on a snowy day? Make art of course! 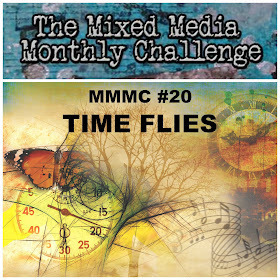 Carolyn Dube's Use Something that would be thrown away January challenge. For a mixed media artist and anyone that practices recycling means it's not hard to find something to use. I chose newsprint because 1. it's a recyclable item and 2. I've never used it with my Gel plate. I also made a stamp to use ( I love making Gel plate stamps and stencils, don't you? This one I created by drawing a flower on some corrugated cardboard and then carved away some of the areas with my exacto knife. I also lifted up that first layer in some areas to show the corrugation pattern and used my Silent Setter to punch some holes through the middle of the flower. I knew going into this project that the newspaper was very thin and might stick but was happily surprised that it didn't tear on me. I did pull it off slowly and gently so keep that in mind if you decide to try it. Personally, I loved how it looked with the text peeping through the painted layer. Awesome, right? Here is a close up of the square print that I made. I took this sheet and used it to cover the back to my journal, you can see the front of my journal here in this post. I think the black go well together. One tip, let the paper dry thoroughly before using your exacto knife to cut around the eyelet so your paper doesn't tear. Wow, I've never heard so much uproar over Pantones color choices as I did this year. Pantone always defends their color choices and this year you have 2 reasons why to use this palette. "As consumers seek mindfulness and well-being as an antidote to modern day stresses, welcoming colors that psychologically fulfill our yearning for reassurance and security are becoming more prominent. 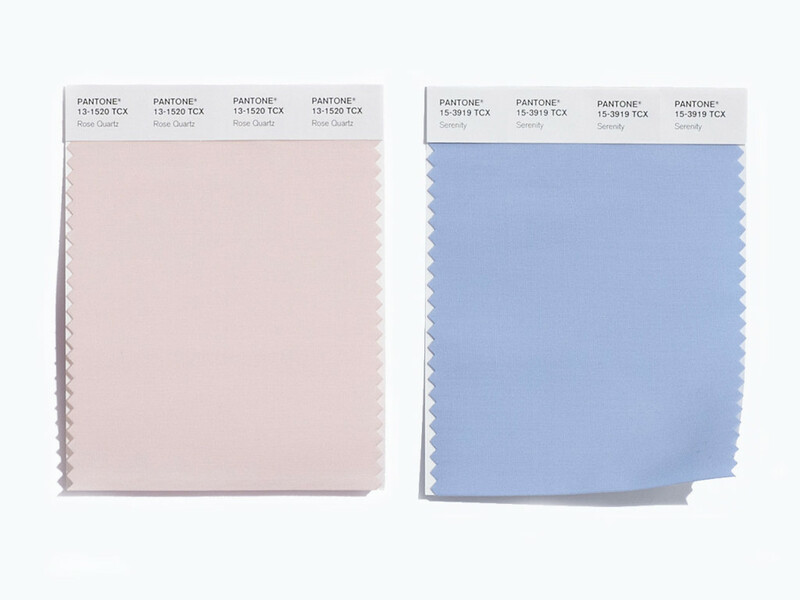 Joined together, Rose Quartz and Serenity demonstrate an inherent balance between a warmer embracing rose tone and the cooler tranquil blue, reflecting connection and wellness as well as a soothing sense of order and peace"
"Pantone hopes to shatter stereotypes and promote gender equality. We get it: Pantone probably thinks that by presenting two colors with such culturally ingrained associations, it’s giving people the chance to challenge those norms. Pink razors for men! Blue razors for women! And fair enough—it’s an admirable goal, if a little derivative ." Whatever the reason you choose and whether or not to choose to create anything in this color range it totally up to you, but our group - Creative Arts Collaboration has a slew of art videos to watch of artists creating something from this particular palette. Hundreds of artists will come together to create a video art festival showcasing winter art themed in every visual and craft media. If you would like to see more of my videos please make sure to subscribe so you don't miss anything! In this case, it was time I could let go of my divorce papers from the 80's. I think everything is finally decided upon by now, lol It's not that I wanted to record the heartache but I wanted to establish that I have healed from it. Join me over on the Arnold Grummer blog to see how I used the divorce papers to make some pretty art from it. Used the free printable from the Capture files, they have lots of darling printable there for free! I cut mine out, added some Ranger's Silver stickles to the flash and some Glossy Accents for the lens cover. 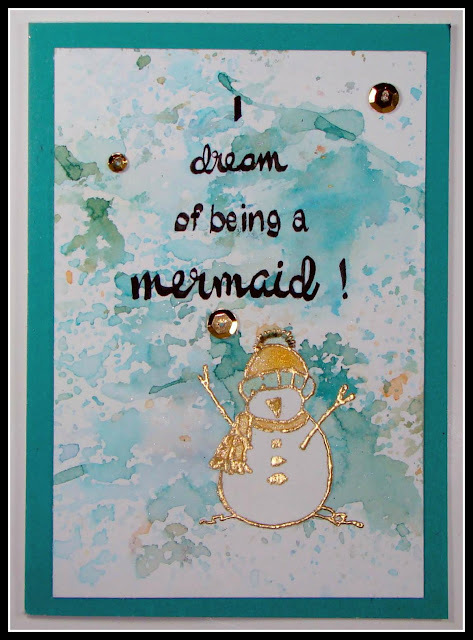 For the background I used my Ranger Spritz tool with my Tombow marker for a speckled look and added some sequins after I stamped the sentiment. I've had plenty of cards published before so why is this card egg-stra special to me? That's because the image is hand drawn...yep, that's MY artwork on this card! This site, the 3eyedbear has the cutest cut and paste printables and for my project today over at the Helmar blog. I used this pattern to make my little owl and I think he turned out soooo cute. I hope you pop over there and visit and then go to the 3eyednbear and grab some printables for yourself! Come back this Friday on the 15th and I'll show you what I put inside the treasure chest! I love my big chunky art journal and I finally got around to making a cover for it too. So excited to be almost finished, I was hoping to have it completed by 2016 but alas, I am about 4 pages shy to completion. I used some magazine cut outs, stickers, tissue paper, molding paste and paint along with Andy Skinner's Alphabet Spaghetti stencil to create this cover. So far sticking to the plan, I decoupaged some tissue paper in the center....it looks so nice and neat...and controlled doesn't it? Still hanging in there with the plan, taping off my crisp border and adding some acrylic paint to the center. Then I went back and added more molding paste through the stencil and frankly began liking it so much more than the stiff and controlled start that I began with....and this is the way my mind goes when I creating something...slightly off from where I began! I took some black paint and went over everything...then wiping it off...adding splotches of gold paint around too...and I also added a Poppy stencil which had been my intention originally except it was going to be in that nice clean center that I messed up....or did I mess it up, or make it look better? 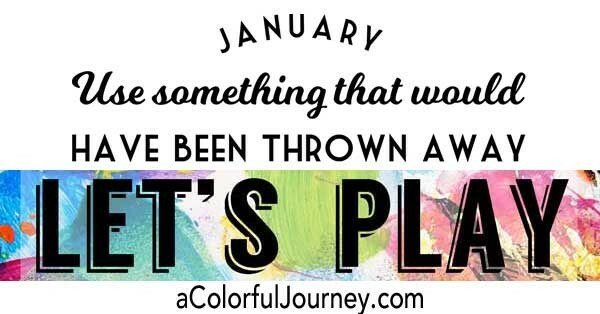 From there I cut out a butterfly from a digital download and cut out some words from a magazine to create a sentiment that fit my journal, and ya know what? I absolutely love the oops and what it turned into. I'm so glad that the mistake happened and even happier that I didn't let it get me down and pushed through! You might guess from the shape of the box that I used an old Valentine candy box to upcycle. They make a great size gift box although mine is going to hold something different and you have to wait until my next Arnold Grummer blog post to find out. I wonder if anyone can guess what it will be? ...hmmm? Some people consider this horrific to recycle a card because they keep them, (like forever) but hey, if you send me a store bought card, it's gonna get recycled. Now handmade cards on the other hand are another story! I am playing along with Paper Issues today with their Take 5 challenge. ...and I just love how the embossed gold and sequins make this card shine! It all began with this marble pencil holder which had been my fathers. I grew up with it sitting on his desk and just had to have it when he died. It weighs a ton and has doubled as a paper weight on many occasions. This one holds all my extra large brushes easily without any worries of toppling over. Sometimes the color attracts me as this red mug did. It's actually a Copy Works mug they give away and one day I will decorate it, but until then I love the color and it holds all my acrylic paint brushes. This was another advertising mug that I painted over with black drippy looking paint, it holds all my water brushes. And this pretty sparkly one holds all my watercolor brushes....which is just perfect as I think those brushes are extra special. I have one more I've added to the group but you'll need to pop over to the Arnold Grummer blog to see it...yep...it's draped in a sheet of handmade paper but it might not be what you're expecting...just saying, go take a peak. I had a fairly busy past 2 years with selling my art, it was a lot of fun and very gratifying experience, but it was also a lot of work and somewhere along the way drawing and painting just for the fun of it was lost. I want to regain that feeling and relax for awhile which is why I withdrew from the studio and when I say relax, I mean to renew what art originally meant for me....a way to just express what I am feeling. I also printed out on the computer using different fonts some daily affirmations.